The entries include fruits, all local produce including vegetables, flowers, photography, baking, needlecrafts, pottery, homemade wine, canning, woodworking, sewing, paintings, all crafts, grains, poultry, rabbits and much more! As early as 1908, local growers competed very successfully in apple fairs or fall fairs in Nelson, Cranbrook, Kaslo, and Grand Forks, and even in Spokane and London. 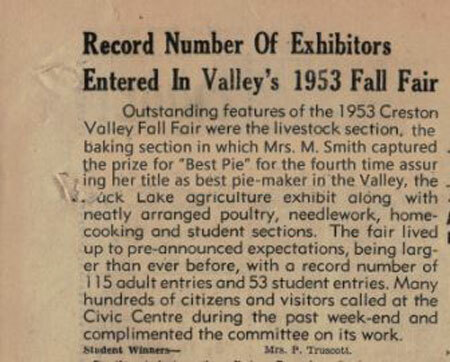 The prizes the local fruit won at those fairs helped boost the Creston Valley’s fame as an apple-growing district. It was not long before local residents began thinking of establishing a fair of their own. By 1911, the Fruit Growers’ Association had taken the matter in hand; what was probably the first local apple fair took place that autumn. 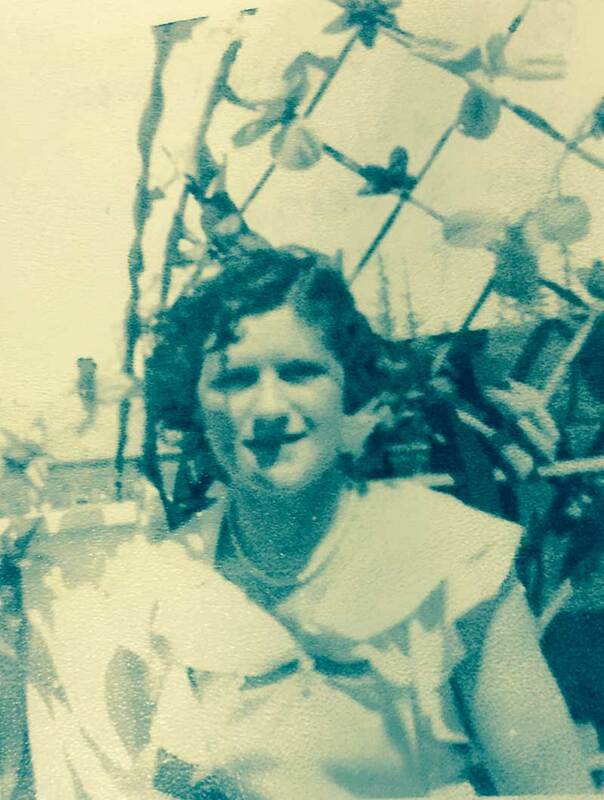 It followed a packing school held in the Creston Valley, at which farmers were taught the best methods of packing apples into wooden crates to protect them during a long train journey to market. Not surprisingly, the judging at that fair focused just as much on the quality of the packing as it did on the quality of the fruit. Success at those apples fairs was, in many ways, a direct reflection of a person’s ability to make a good living as a farmer. In 1914, a newly-formed Agricultural Association presented an apple fair; we’re not sure if this was a new event or if the Agriculture Association simply took over the earlier Fruit Growers’ Association fair. Over the next few years, there were also a “Boys and Girls Club Fair” and a fair organised by the Creston Women’s Institute, which included baking, canned goods, needlework, and the like. Until 1918, these fairs – and possibly a few other similar events – were all held independently under the auspices of their respective organisations. But, in 1918, the three collaborated and presented a single fair that was bigger, better, and far more well-attended than anything that had occurred previously. That first Fall Fair required three different locations to house everything: the Mercantile Hall, the Speers Hall, and an empty lot where Morris Flowers stands today. The following year, the Agricultural Association built Park Pavilion in what is now Centennial Park. It became the community’s first recreation centre, but maintained its original purpose as the home of the Creston Valley Fall Fair until it was destroyed by fire in 1946. After that, the Civic Centre on Canyon Street, built in 1947, served as fair grounds until 1968, and then the present-day Recreation Centre became the Fair’s home. This is not to say that there has been a fall fair every year. There hasn’t. At various points in the Creston Valley’s history – the Great Depression, during the Second World War, in the few years between the Civic Centre fire of 1968 and the opening of the Recreation Centre about 1971 – the Creston Valley Fall Fair has dwindled to almost nothing, been temporarily replaced with flower shows or school fairs or similar events, or disappeared altogether. But there has always been someone – an individual or an organisation – who recognised the value of a local agricultural fair and worked tirelessly to revive it. Given its roots in the earlier apple fairs – and the overwhelming dominance of apples in the local agricultural industry – it is not surprising that the early fairs were held a couple of months later in the year than today’s fairs are. 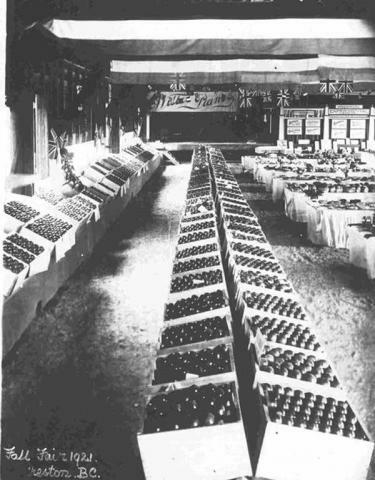 Apple exhibits were by far the largest component of the early fall fairs: a photo from the 1921 Fall Fair shows row after row of full boxes of beautifully-packed and polished apples. Prizes were awarded for best apple, best plate of apples, best five boxes of apples – even best twenty boxes of apples. November fairs took place just after the peak apple harvest, when the quality and quantity of local fruit were at their best. Some of those classes soon fell by the wayside for obvious reasons – imagine the work involved in selecting, polishing, and packing enough perfect apples to fill twenty boxes! But changes in agriculture, society, and even technology have also had an influence on the classes at the Fall Fair. In the livestock section, for example, we no longer have a class for “Mare with Foal at Foot,” simply because horses are no longer the principal source of farm power and the ability to breed quality horses is much less important for farmers today than it was a century ago. A shift to a September fair date means we can better showcase the variety of fruits, vegetables, flowers, and other produce grown here, instead of focusing so heavily on apples. The apple classes that remain now only require four or five apples on a plate – gone are the gigantic exhibits of apple boxes. And that makes perfect sense, given that apples are no longer the single-most important crop; and a farmer’s livelihood, even if he or she does grow apples, is no longer so entirely dependent on his or her ability to perfectly pack many boxes of flawless apples. The original Boys and Girls Club fair gradually morphed into the present-day student and 4H classes, passing through school fairs and Future Farmers fairs along the way. Special classes appeared in 1967 encouraging displays celebrating Canada’s 100th anniversary. Ladies no longer have the opportunity to enter “six buttonholes” in the sewing division (does anyone make hand-made buttonholes anymore?!? ), but classes now include machine-quilting – unheard of in the early days of the fair. The school track meets and other large sporting events that once accompanied the fair have disappeared, but entertainment and education remain key elements of today’s fairs. And organising it all is the Creston Valley Fall Fair Association – the successors to a long line of community groups who saw the need for a local fall fair and have worked tirelessly to make it happen, year after year, for the past century. Check out the headliners page. Blossom Festival News Articles. Submit your event news. ©Creston Valley Blossom Festival. All Rights Reserved.